My shadow has shown up in a few photos too. Mine usually ruins the shot. LOL Madis’ comment. Have a wonderful wordless Wednesday. what hides in the shadows? it is finn and charley! Tell your momma to move a little to the right so Momma’s shadow can block some of the sun over Finn too. 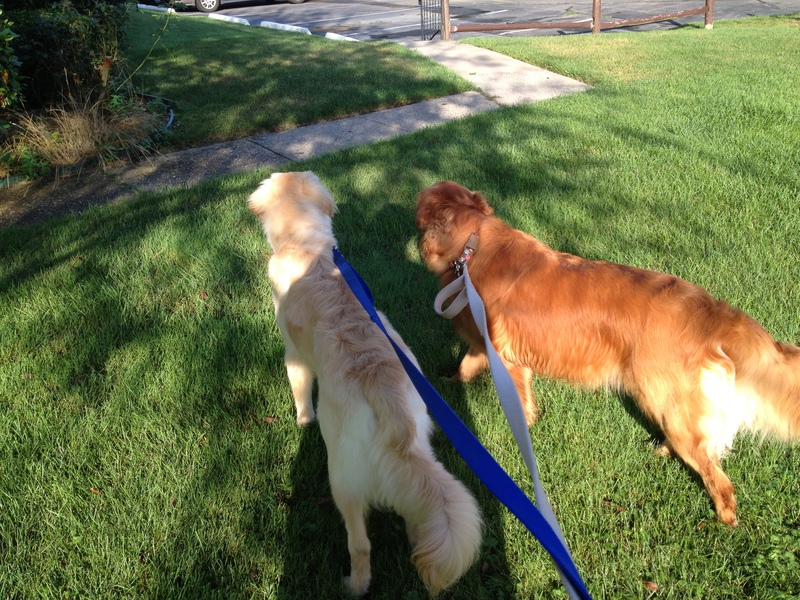 You guys look like mags and gus when they walk only you are a little bigger than they are! Really, Finn and Charley, you need to train your Mom to get out of the way of YOUR photos! Happy Wednesday Finn, Charley and Mom. Enjoy your walkie! Shadows can make moms look huge! It keeps the ground cooler don’t you think? Nice!! Now, you guys take the picture! That’s the closest we’ve ever got to seeing your momma! BOL! Mom is providing some shade for the kids! Nice! we posted one on Dakota’s blog a few months ago. Shadows are fun! How nice of your mama to provide a bit of shade for you! TeeHee…you guys are walkin’ all over your Mama!! Are you trying to catch her shadow? Be careful not to step on it! Lol! Your paws are all over your Mom! I love shadows, means it’s nice sunny weather. Makes walkies so much nicer. Hi Beautiful Finn and Sweet Charlie! Lovely photo! Aren’t shadows so fun?! Where are your shadows? Looks like you are having some very nice weather, the grass is so green! Enjoy your walkie with your mom and her shadow! Cool photo – shadows are so interesting!